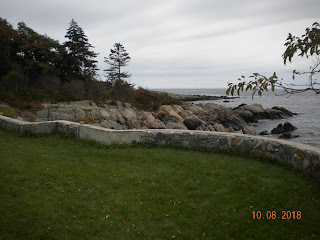 Fascinating, family friendly obscure places to visit in Maine. 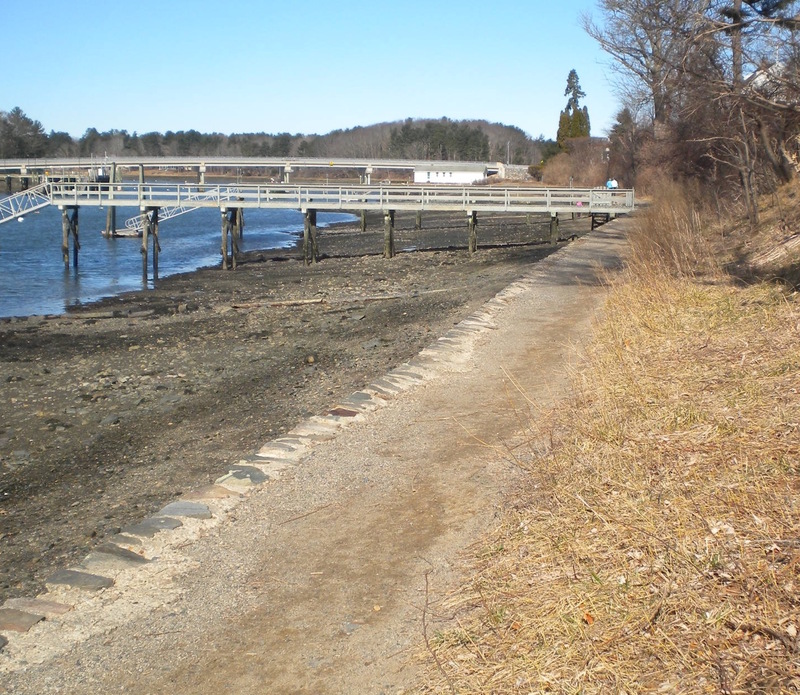 Fisherman's Walk is a flat, level walking path along the tidal York River, and connects York Village to York Harbor. You can continue on over Wiggley Bridge and into Steedman Woods. The walk is quite easy, but finding it is a bit of a challenge, and parking can be a challenge too (except as noted below). From York Village, continue down York St. / Route 1A towards York Harbor. You can park on this street in the vicinity of the Post Office (on your right), but not in their parking lot. Some sections are signed for one hour parking, some for two hour parking. (Note: Parking here puts you right in the middle between Fisherman's Walk and Cliff Walk. Leave your car here to explore both). Locate Verrell Lane, just before the Post Office, same side of the street. Walk down this short lane to the end. The entrance to Fisherman's Walk is not signed, and certainly not obvious. 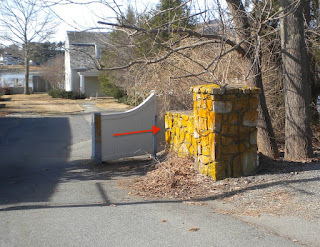 You pass between the white curved-top gate and the yellowing stone wall (see arrow below). Kathy looks down the entrance path. It is only visible from this perspective. 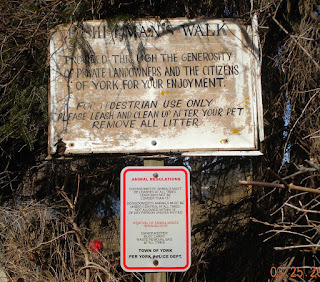 There is a sign halfway along the entrance path, well worn. When the foliage is out, it will probably be obscured unless you look closely. 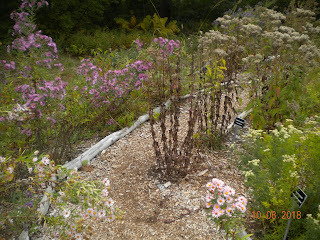 You emerge from this little path onto the walk. It heads northwest along the river, the route is well kept and obvious from here. 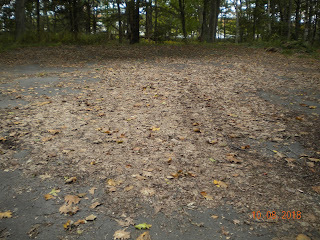 When you reach the paved cul-de-sac of Barrell Ln, there is one public picnic table right on the water available here. The Fisherman's Walk ends here, but the path continues to Wiggley Bridge and Steedman Woods. Walk up Barrell Ln, past the Sayward-Wheeler House (there is an interpretive sign), the path exits to your left and there are several concrete steps. 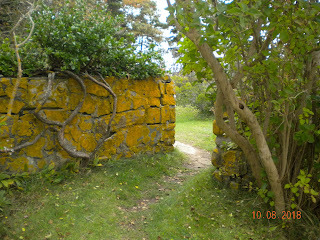 Follow the path towards the bridge. At the bridge, turn to the right to go up onto Route 103, or turn to the left, and you can pass under Route 103 - a much safer choice. Passing under Route 103, continue along a long wooden pier up to the causeway to Wiggley Bridge. 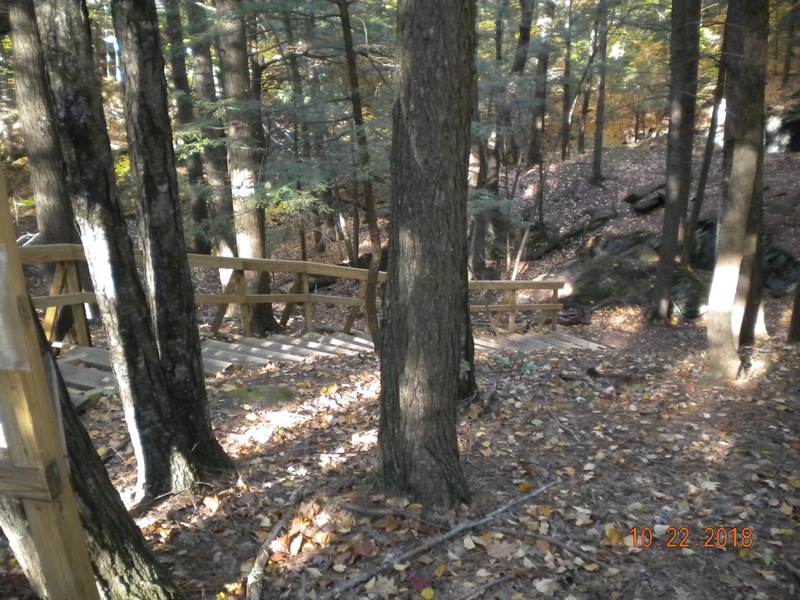 Cross Wiggley Bridge to access Steedman Woods park, with a nice walking loop. Accessibility: Excellent. Three steps on pathway where it exits Barrell Lane, other than that flat and smooth. 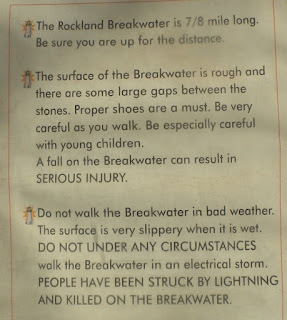 The Rockland breakwater is a fun walk, and safe as long as you use some common sense. 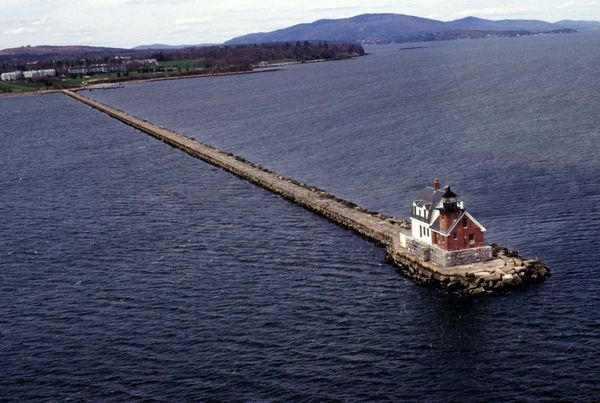 It is a mile out to the lighthouse - you will be essentially walking a mile out into the ocean! 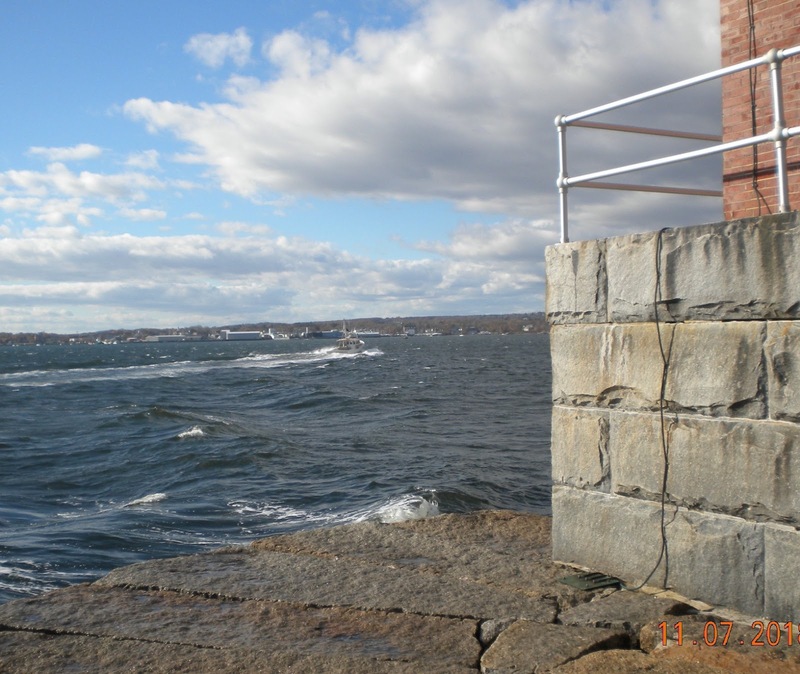 High tide comes flush with the top of the breakwater, and waves will cover it completely, so consult the tide chart and do not venture out if the tide is coming in. From the parking area on Samoset Road (which, incidentally, does not go to the Samoset), there is a small picnic area and a trail out to the breakwater. also...don't get caught out there at high tide! The breakwater is wide and flat, but due to the gaps between stones, you cannot walk and look around at the same time. Keep your eyes on your feet, and stop if you want to sightsee or take photos! One mile is a long way, and you will need to do it twice! 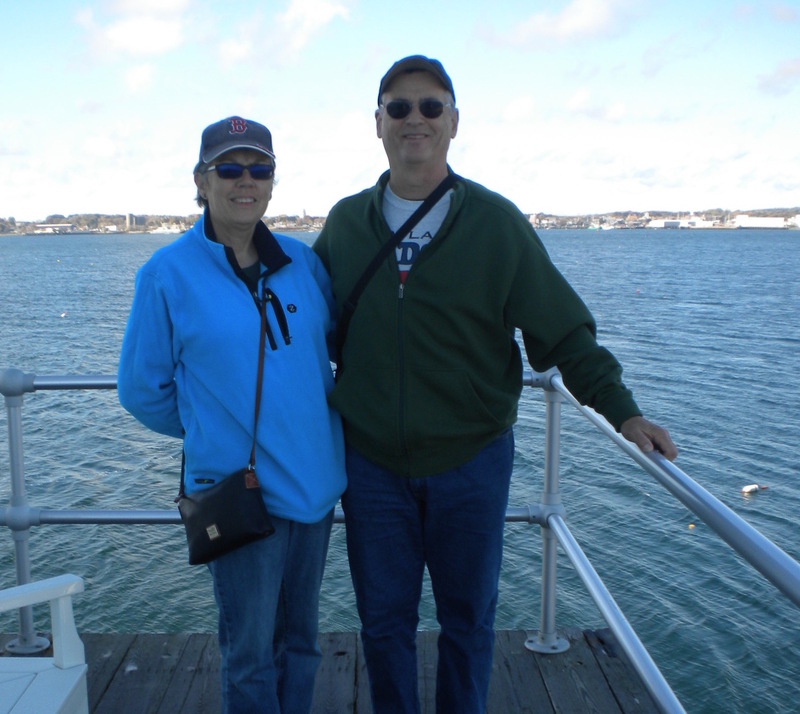 heading to the lighthouse - see it? The lighthouse is open to visitors on Saturdays and Sundays. You can go inside and up in the light tower. There are no rest rooms! From the very end of the breakwater you get a closeup view of boats passing by. Even when the lighthouse is closed, you can go up on the deck around it. There are some bench seats and great views. 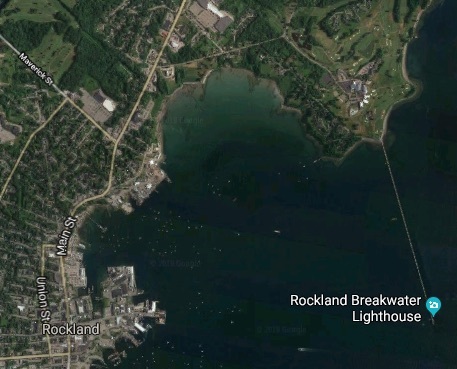 From downtown Rockland, take Route 1 north. Right onto Waldo Ave. Right onto Samoset Rd, go to end. 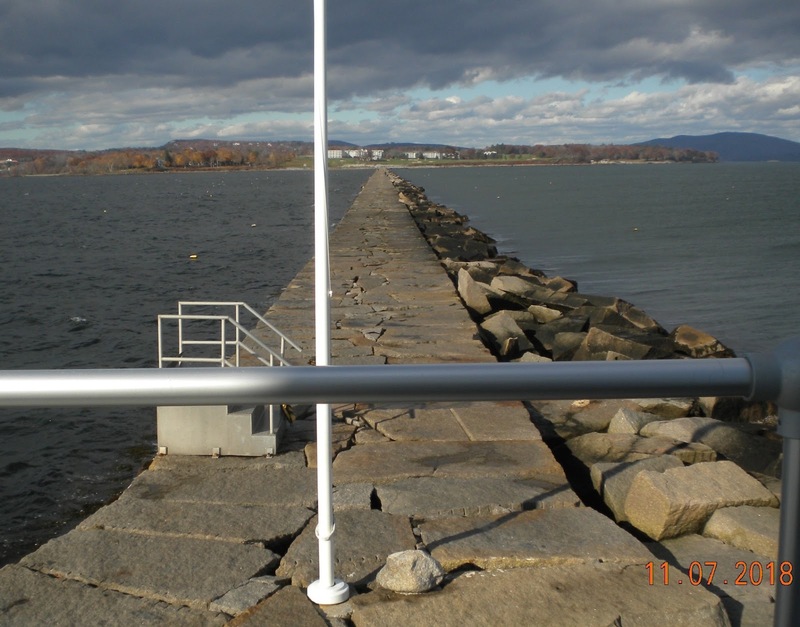 Note that the spaces nearest the breakwater are reserved for emergency vehicles. You can walk from downtown, but it is a long way. 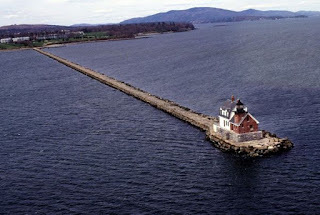 It is 4 miles from downtown to the lighthouse. We have done it. One advantage is that there is a Dunkin Donuts half way. 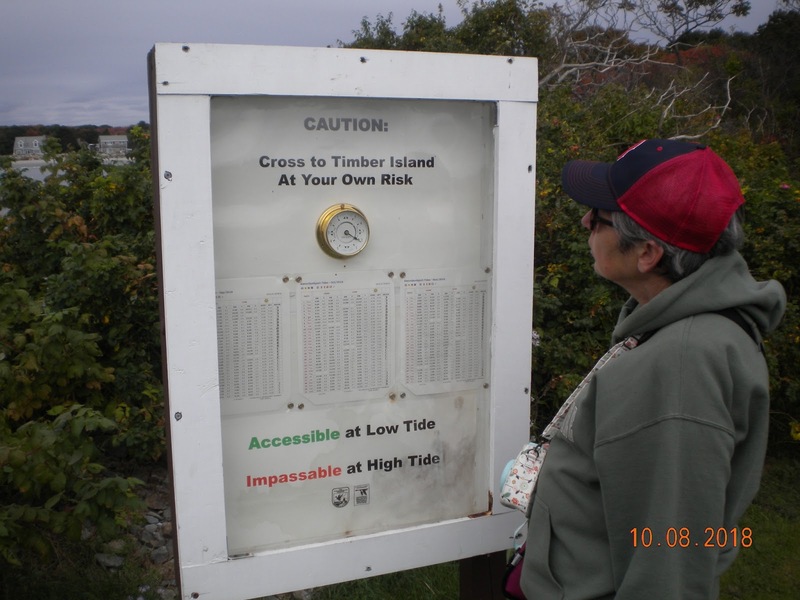 Hours: Daylight only, but watch the tides! Accessibility: Definitely not. 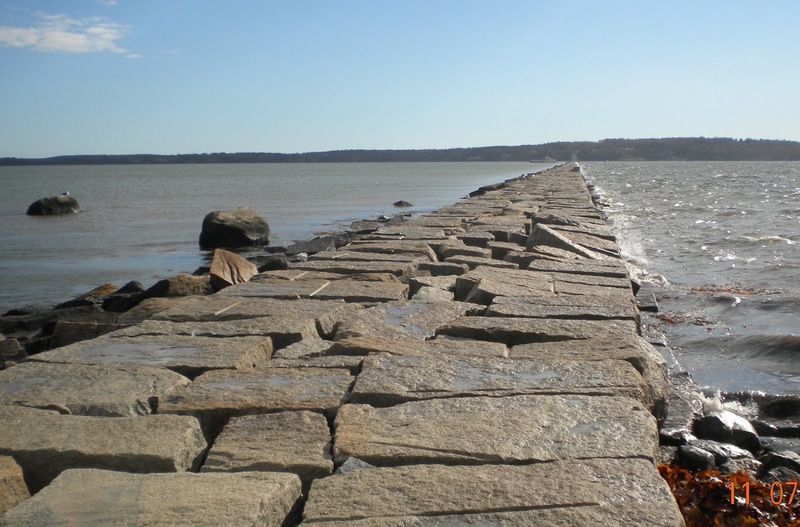 Breakwater is mostly flat on top, but has large gaps between stones. The Rockland Harbor Trail stretches from downtown Rockland out to Sandy Beach Park. 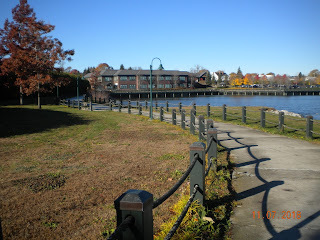 Starting at the north end (Harbor Park, Main St & Pub Landing Rd), it begins at the parking lot (free parking, picnic tables) behind the police station, goes past the harbor master's building, and up onto a wide boardwalk. 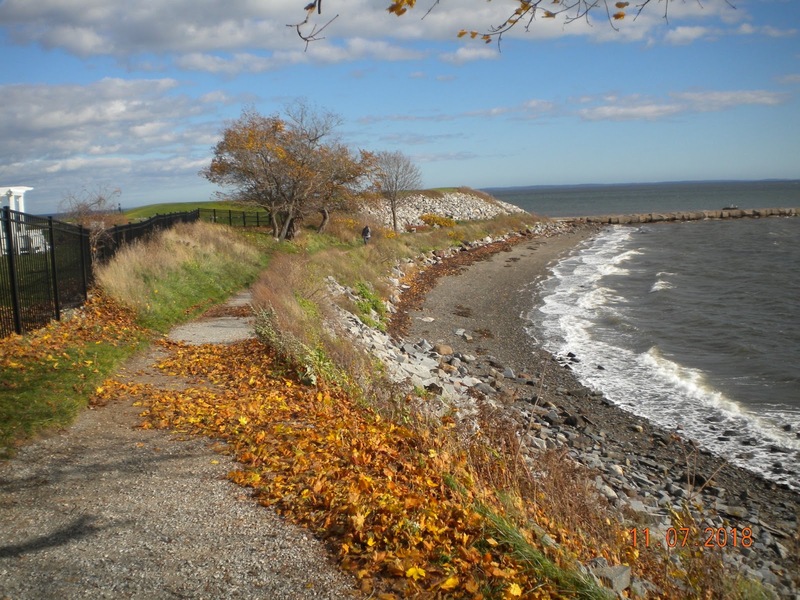 After passing Archer's Restaurant, the trail leads to Sandy Beach Park and South End Beach, a small beach which is a favorite for sea glass collecting as the tide goes out. The term "sandy" is a bit generous, it is more like coarse gravel. 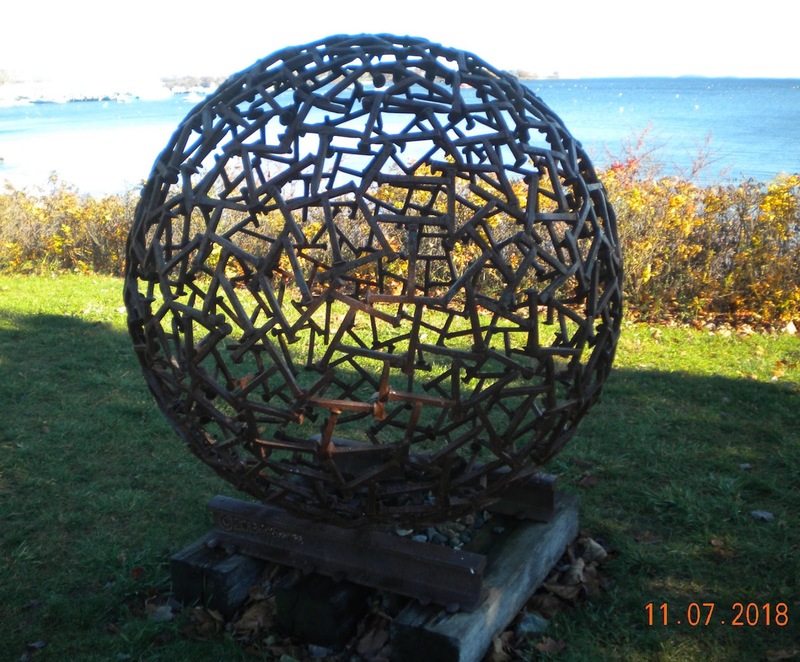 This is the home of "Ridin' the Rails to Rockland', a 2013 sculpture by Jay Sawyer, comprised of railroad ties welded into a sphere. 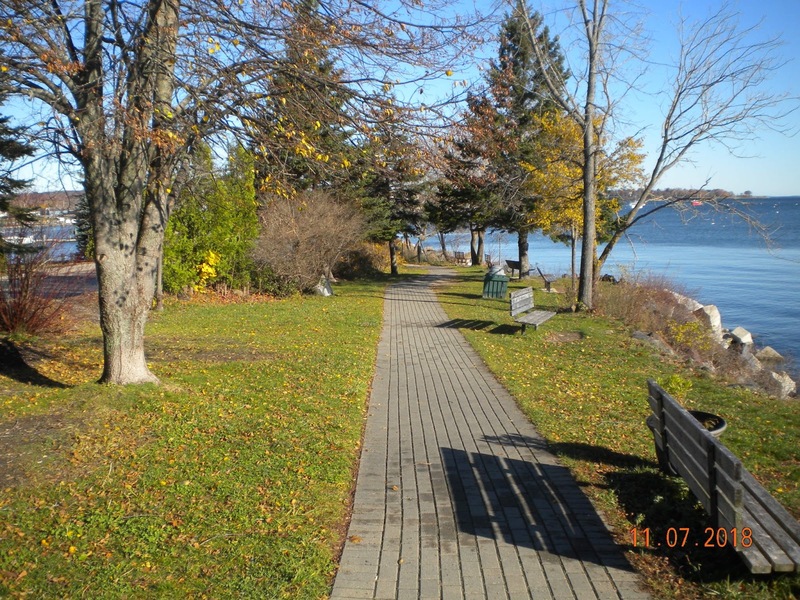 Picnic facilities are at both ends of the trail, however the south end (Sandy Beach Park) is definitely preferable, having parking, a big grassy area, grills, and a beach. The north end of the trail only has picnic tables at the parking lot. 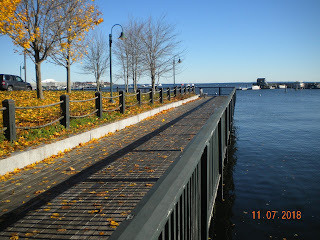 North end: Harbor Park (intersection of Main Street and Pub Landing Rd, go down the hill next to the Time Out Pub). 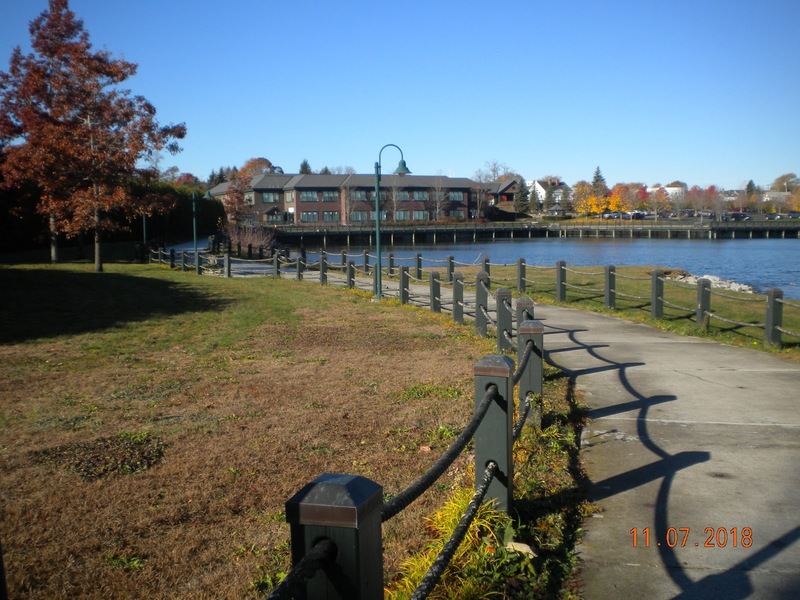 South end: Sandy Beach Park is on Scott Street. Picnic potential: Tables at both ends of trail, grills at south end. 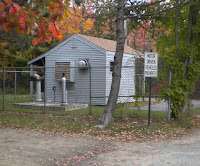 Rest rooms: Public rest rooms available on Tillson Ave., a short walk from north end of trail. The police station probably has them too, but we have not checked. 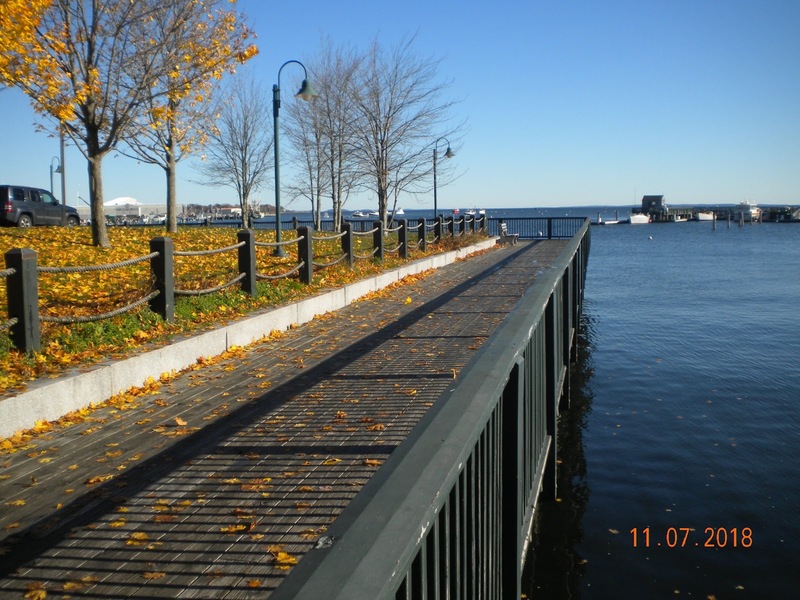 Accessibility: Boardwalk and Harbor Trail is fully accessible, wide with access ramp at north end. Beach is only accessible by stairway. 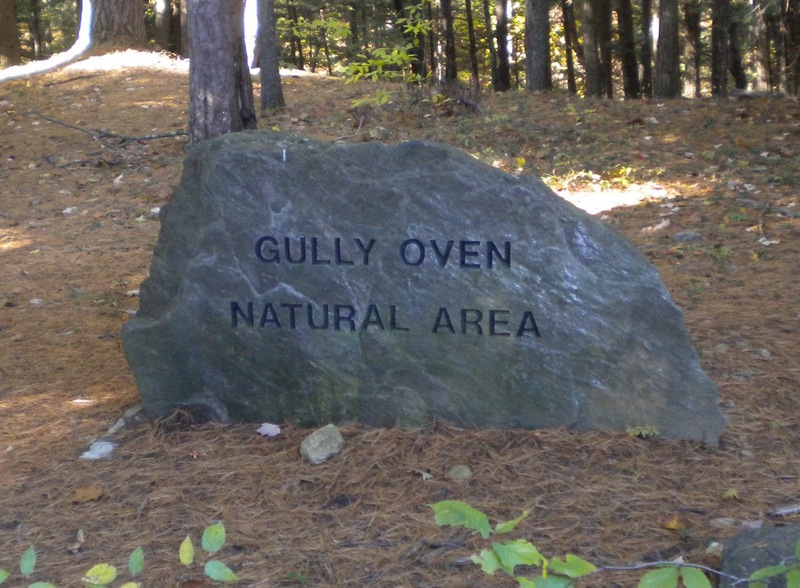 Gully Oven Natural Area is a deep glacial ravine in the hills of northern Lebanon, Maine; and fun to explore. 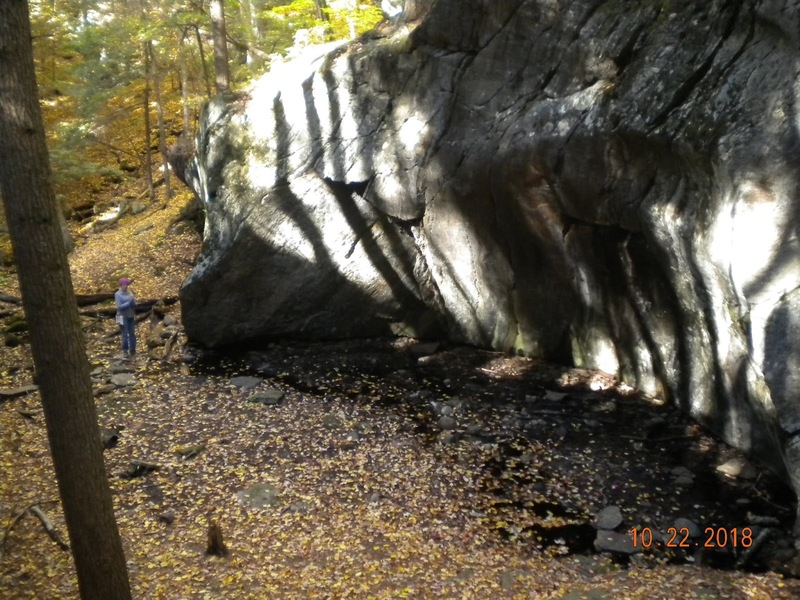 Immense rock formations show curved wear from moving water during glacial times. 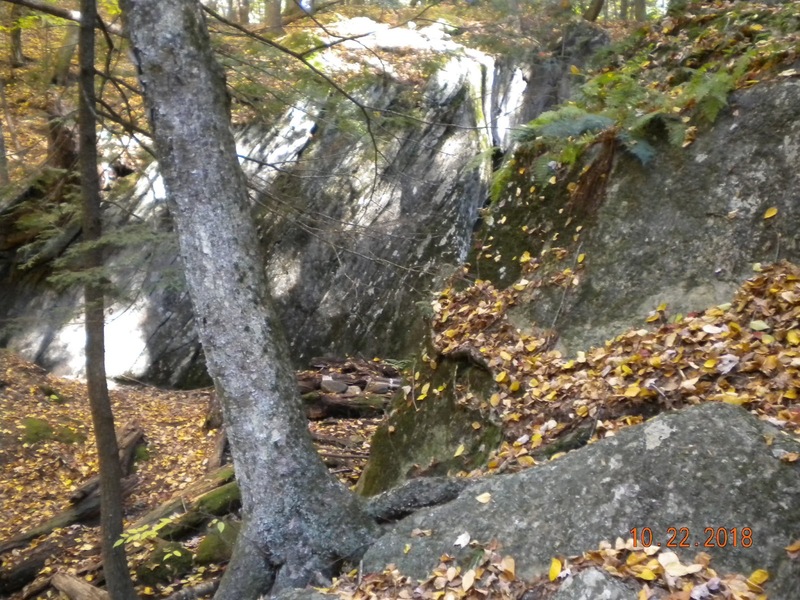 The highlight is a large shell-shaped rock enclosure, similar to The Basin in Franconia Notch, NH; but significantly less known and developed. 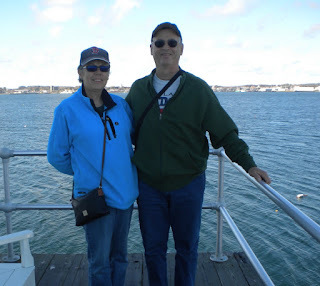 You won't find tourists here - we had the place all to ourselves. The marker is easy to miss. The area consists of a roadside pulloff space with parking for several cars, remains of an old access road with a concrete cottage (?) foundation, an informational kiosk, and a stairway down to the ravine. There is a stream running through the ravine, so this area may be too wet to explore in spring. Unlike The Basin, there are no off-limits or fenced areas. Explore to your heart's content. This would be a fun place for kids to do lots of climbing around. The entire area is quite steep, walking sticks are highly recommended. At the base of the stairs, it isn't obvious where to go. We turned right and found the entrance to the ravine. The oven. Note Kathy beside it. Many old carvings in the rock. 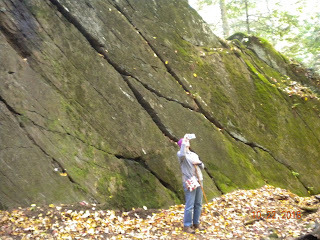 Rocks show curved wear from moving water. From downtown Milton NH, cross the bridge into Lebanon ME. Left onto Champion St, Right onto Gully Oven Rd, approx. 1.2 miles on your right. The location is not obvious. We drove by it twice before finding it. For a landmark, find the house/mailbox at 91 Gully Oven Rd. 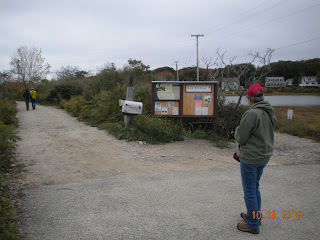 From the mailbox, the pulloff is within sight, on the opposite (west) side of the road. 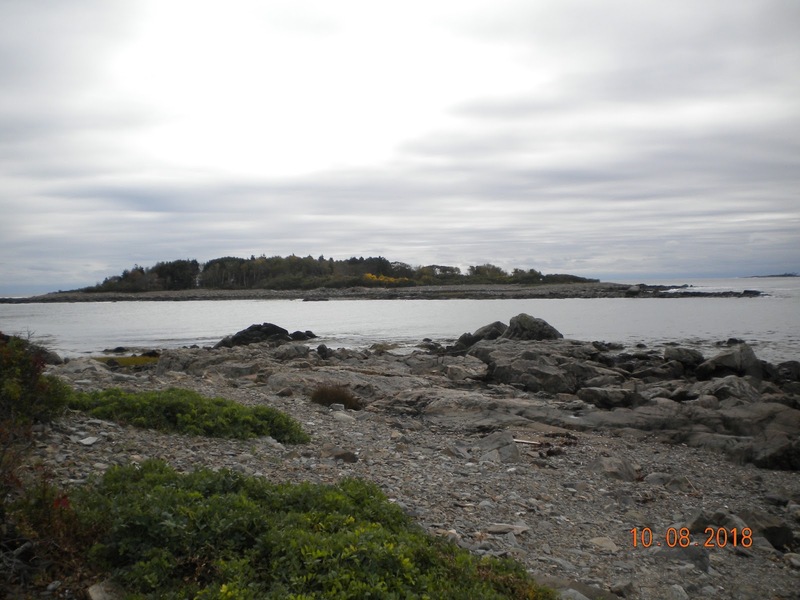 Timber Point and Timber Island are located on a peninsula of Biddeford, owned and managed by Rachel Carson National Wildlife Refuge. 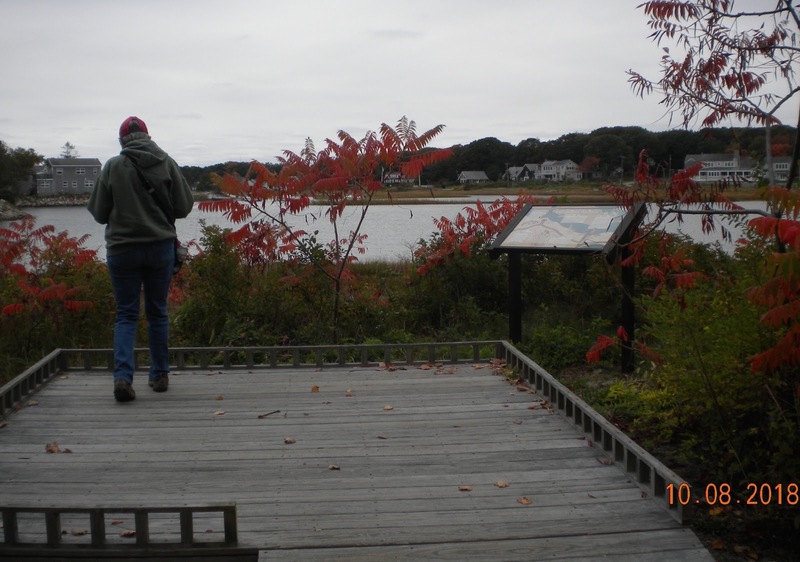 A 1.4 mile walking trail takes you to Timber Point, where there is the preserved Ewing estate to explore. 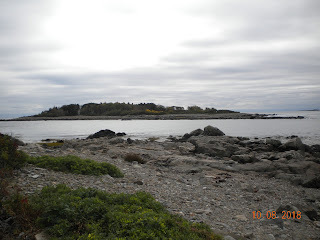 Timber Island may be accessed by crossing at low tide. 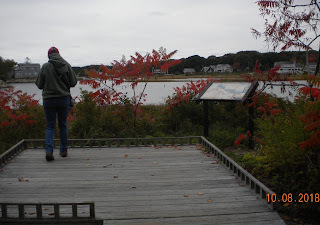 This area is very popular with birdwatchers. See Getting There below for directions. There is parking for six cars - only. Plan your visit at off-peak times! 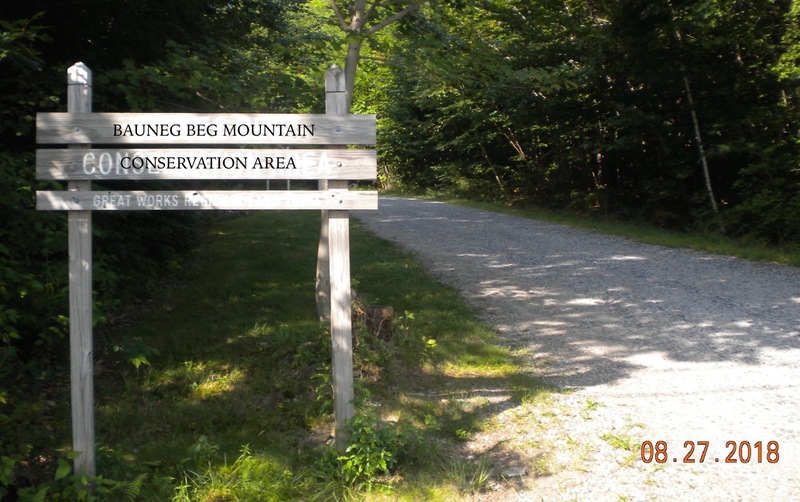 It is a 1.4 mile walk from the parking area. The entrance. No vehicles past this point. Walk along the shore for a ways. 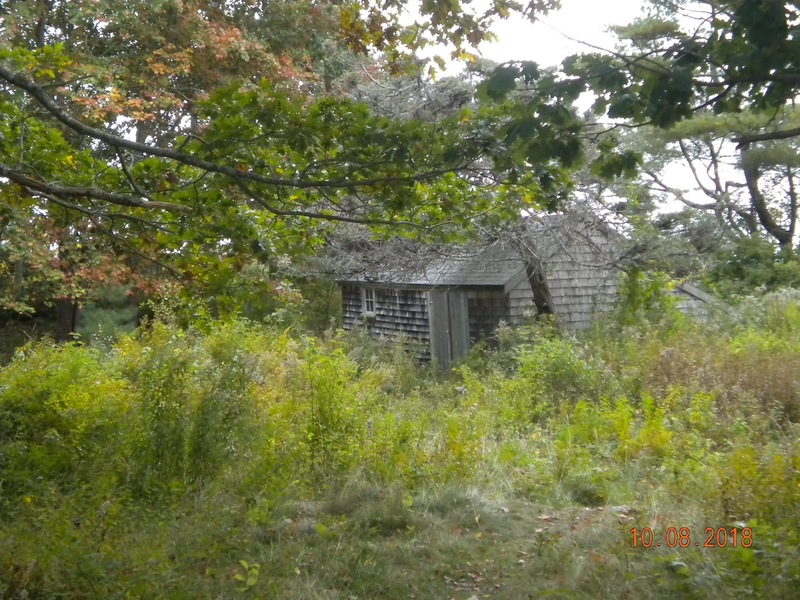 An overgrown boathouse and cottage. The never-to-be-completed lifeboat. See story below. Tide clock and chart allow you to plan a visit to the island. 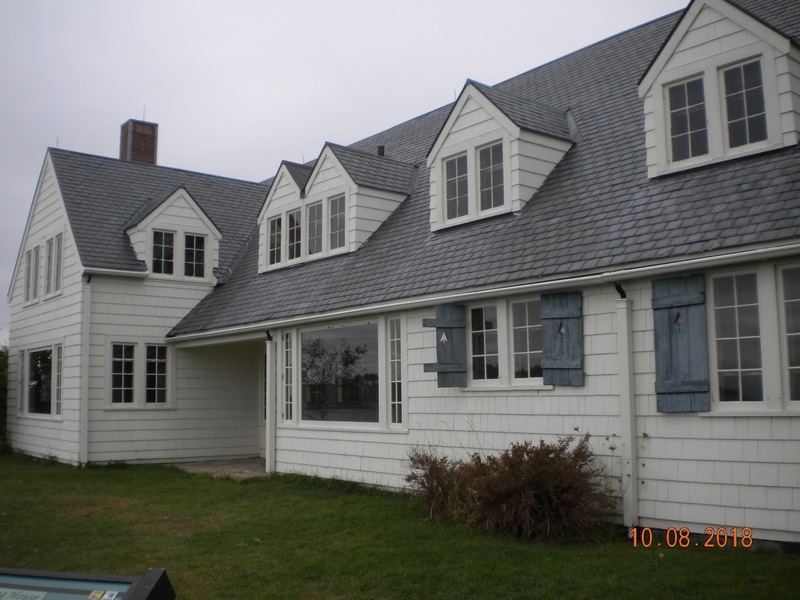 The jewel of Timber Point is the frozen-in-time Ewing estate. This makes the walk worthwhile even if the tides are not correct for a crossing to the island. You can read the history here. 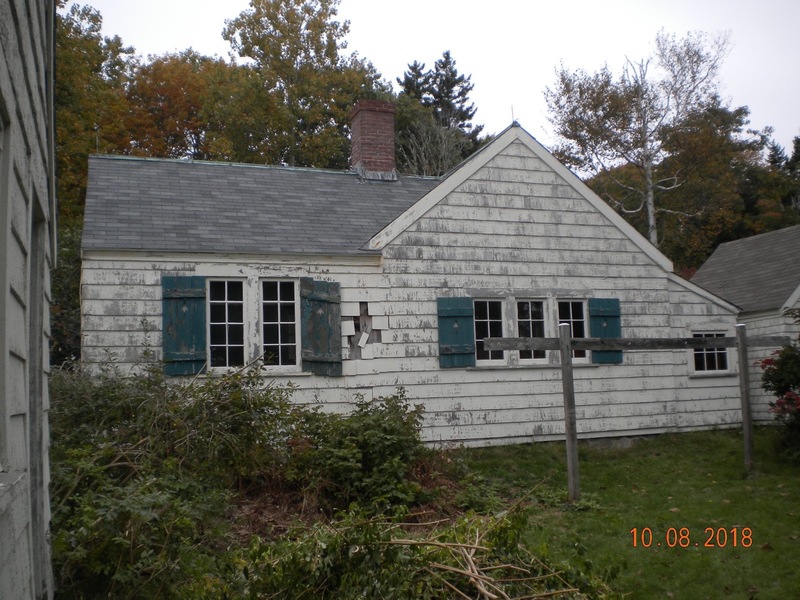 Charles and Louise Ewing built this home in 1930. It has all the appointments of an estate of that era: boathouse, tennis court, potting shed, swimming pool. They raised three sons. 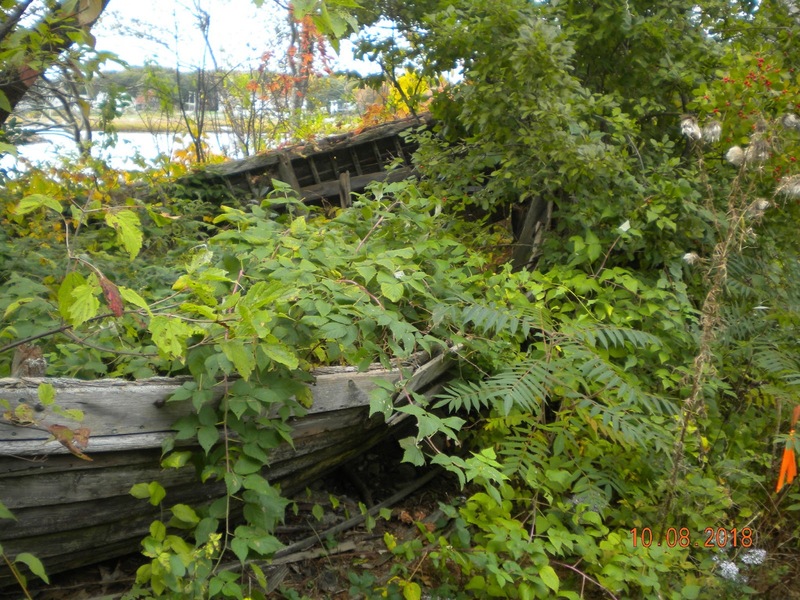 One son was building a lifeboat when he was called up for service in World War II. He was killed in action, and the half-built lifeboat can still be seen at the boathouse. 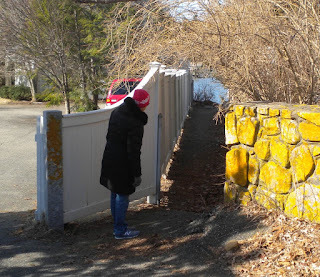 Access to the Ewing estate. Not the winged lion sculpture on the rock wall (click photo to enlarge). Front of the main house, built 1930. Some outbuildings have not stood the test of time well. The swimming pool overlooks the ocean. The condition of the tennis court was a surprise. 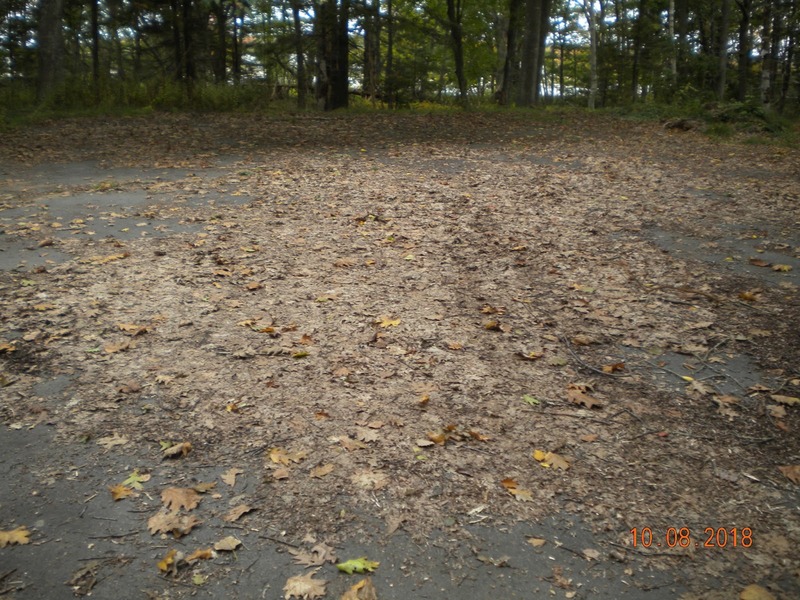 Although mostly covered by leaves during our visit, the surface was hard, smooth, and unbroken, making it appear that sweeping and adding a net would put it right back in service. Plan to visit Timber Point and take a walk back in time to a pre-war estate where the good life was to be had. Caution: Stay on marked trails! Poison Ivy is abundant. 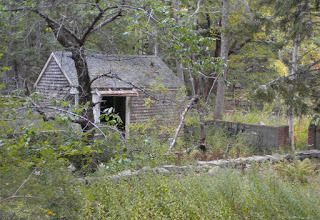 Getting there: from US Route 9 (Mills Rd. 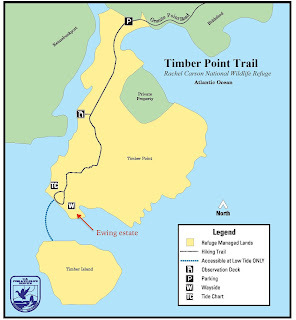 ), follow Granite Point Road to the end. Picnic potential: no tables, but access path along beach has many large, flat rocks which could serve well. 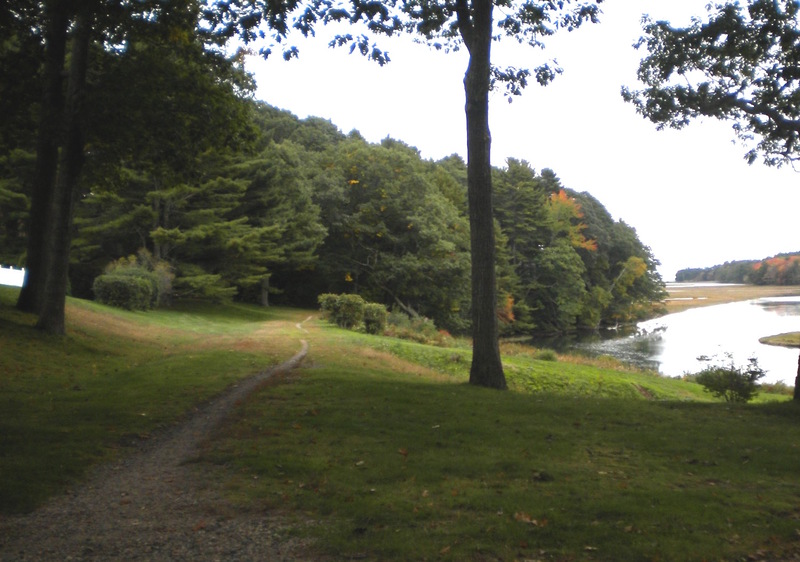 The Kennebunk Bridle Path provides a choice of two flat, straight walks; since the best access point is in the middle. 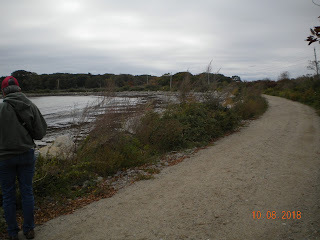 From the Route 9 access point (see Getting There below), the longer western portion runs to the former train station in downtown Kennebunk, and the short eastern portion runs to the golf course on Sea Road. 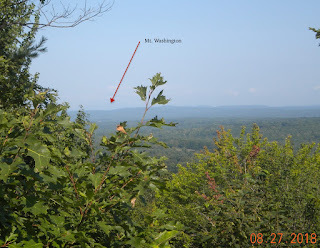 This post describes the longer (2.5 mile) western portion. 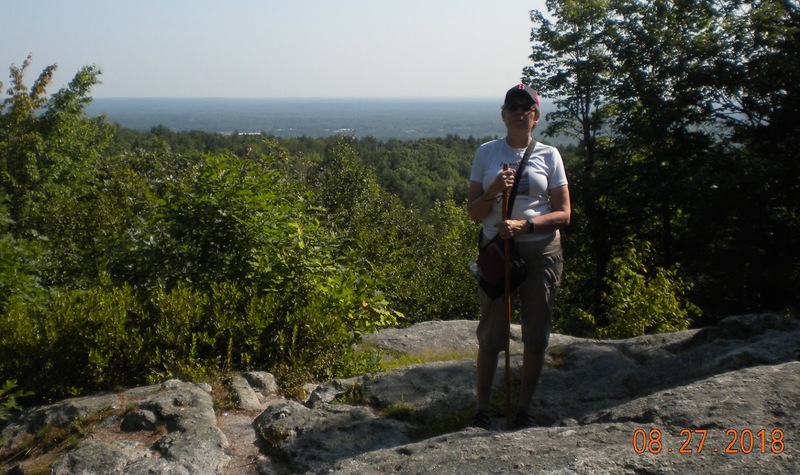 (The trailhead to the eastern portion is on the opposite side of Route 9). 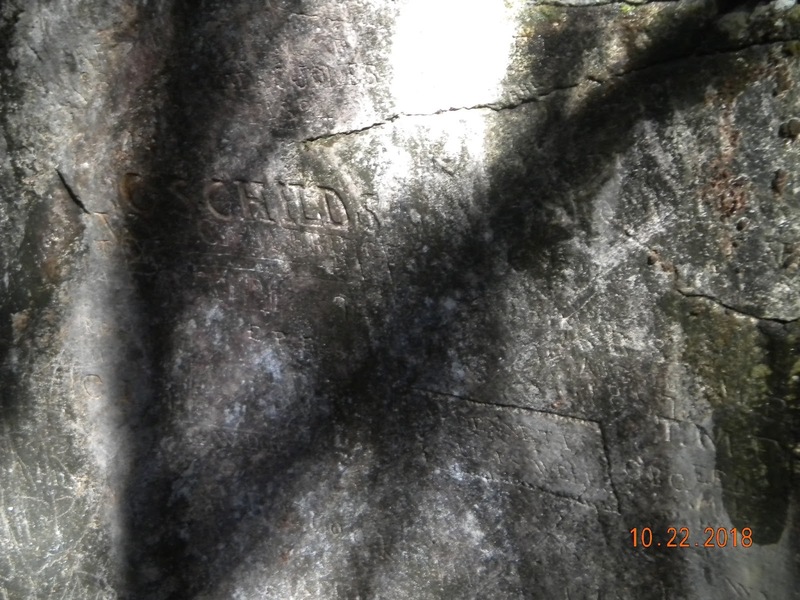 The trailheads are not signed, other than signs stating "Motor Driven Vehicles Prohibited". Chances are you will only find locals here. A historical marker notes: "This path was created on the abandoned railroad bed of the Kennebunk and Kennebunkport Railroad Company. The rail line was built in 1883 to bring tourists and residents to the inns and homes which were springing up near the beaches. The rail line was purchased by the Boston and Maine Railroad in 1919 and discontinued service in 1926." 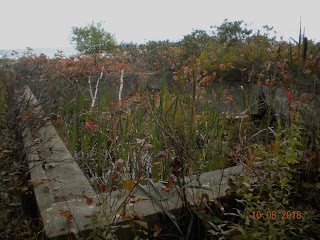 Starting from the utility building, you first cross an open meadow which uses remnants of the old railroad culvert to cross the estuary. Water overflows the path at high tide, which may require wading if you come back at the wrong time! Consult your tide chart! 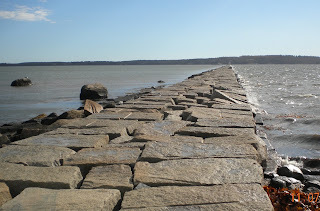 Several inches of water overflow path at high tide. 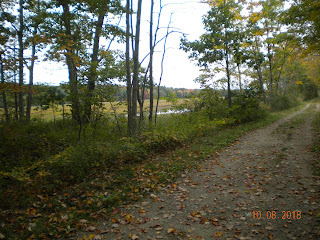 The path continues 2.5 miles to Kennebunk through forest, with lots of water views of the Mousam River; and lots of birds. 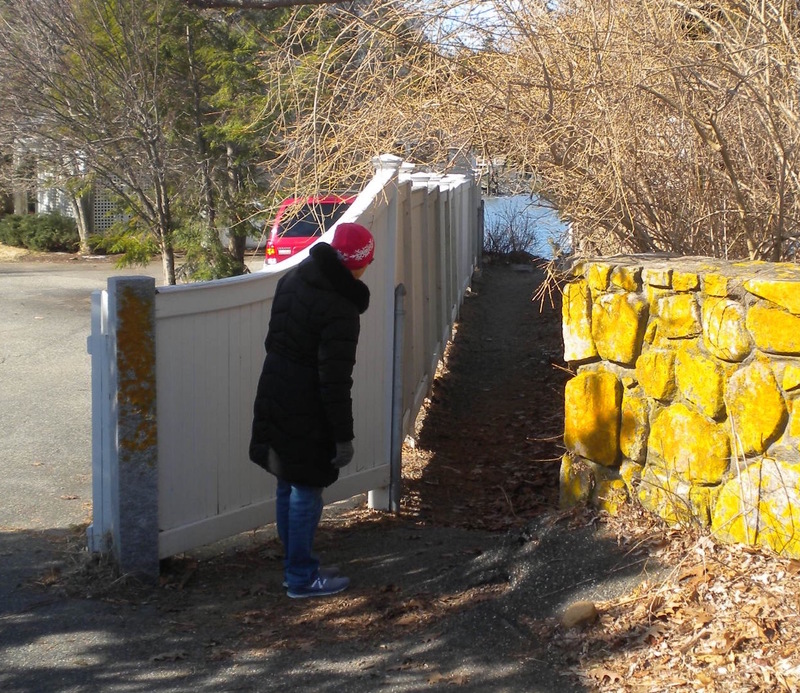 The path provides some peeks at some lovely homes in the area, and crosses several yards, small residential side streets, and the driveway to Sea Road School. At times the trail becomes a rather narrow single-file path. Along the way there is a cemetery to explore, as well as a substantial monument to early settlers which is hidden away in the woods. 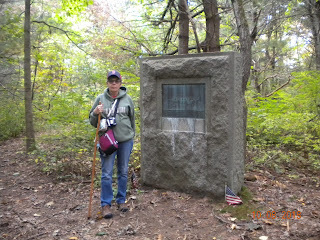 When you pass the historical marker describing it, look for a side trail (same side as the marker) about 100 feet beyond. 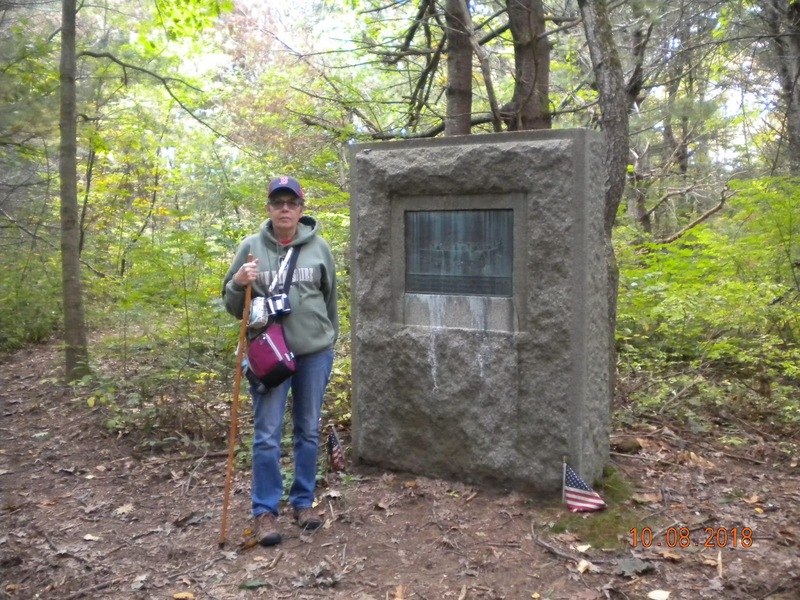 Kathy at the hidden marker. 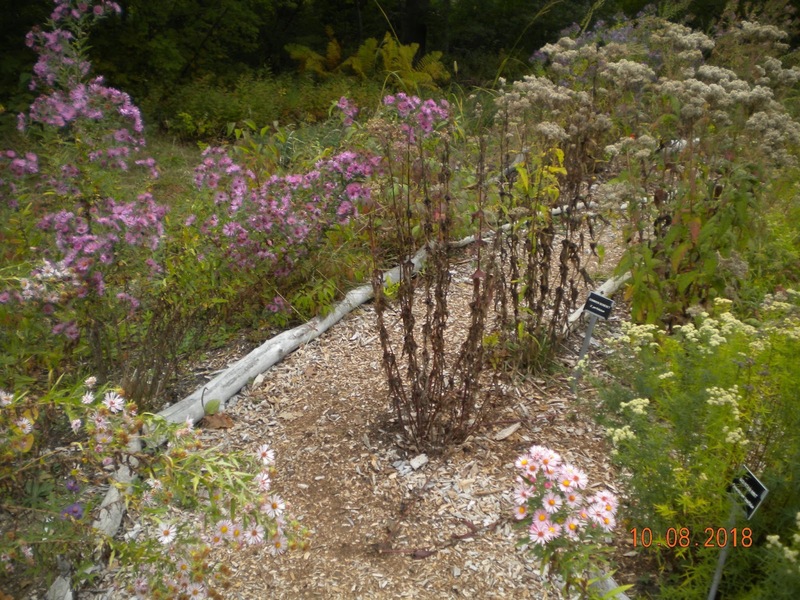 A wide bench is provided near the trail end, a good spot for a picnic. The path comes to a vague end at the railroad tracks. WARNING: These are live tracks used by the Amtrak Downeaster and freight trains, do not cross them or go on them! Turn right and walk up Trackside Drive past several businesses, including the fascinating Old House Parts. Note the remnants of rails sticking up through the gravel, these are the rails that connected to the former rail line you have been following. You can use the Summer Street bridge to cross over the tracks if you wish to continue to downtown Kennebunk. 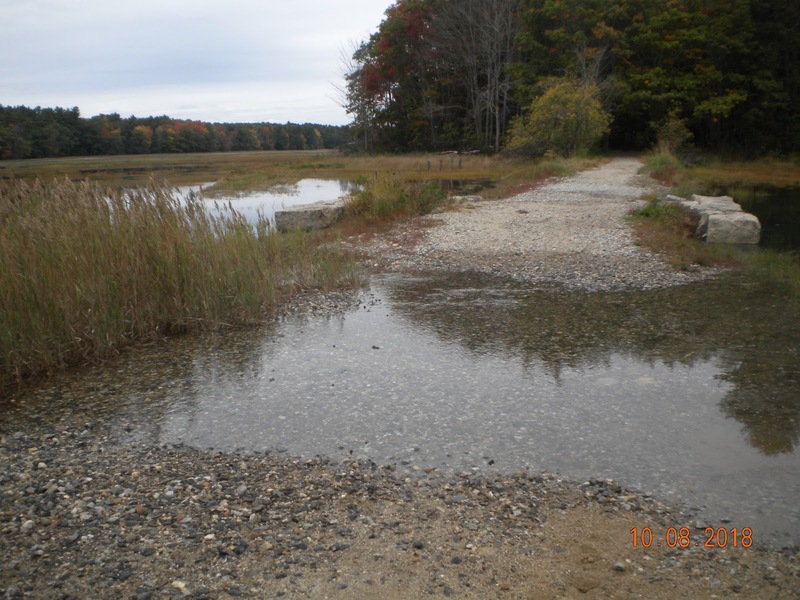 Best access: From Route 1 in Wells, turn onto Route 9 towards Kennebunkport (Port Road) at the intersection by Riverside Campground. At approx. 2.2 miles cross the Mousam River. Immediately after the river, look for a small blue-grey utility building on the left. 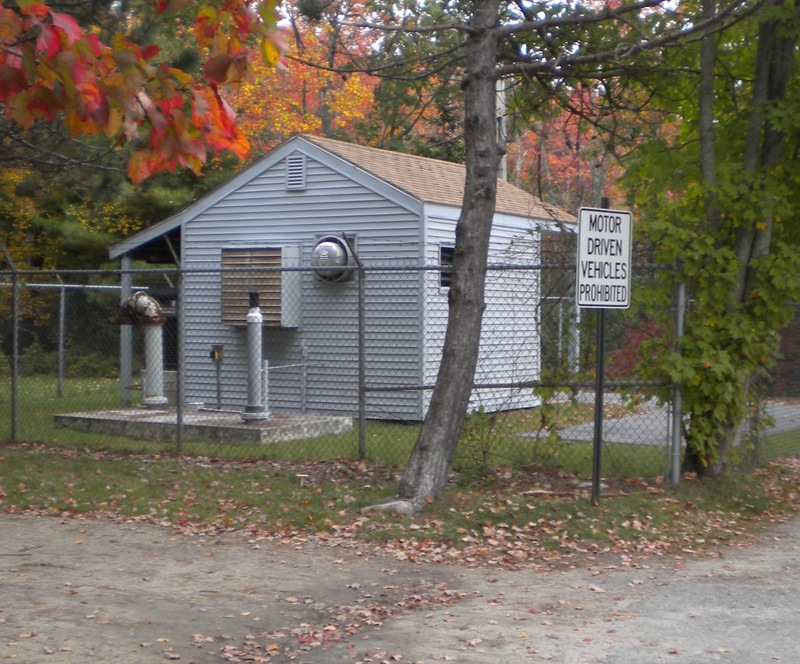 You can park along the road (observing signs), or there is space for a couple of cars behind the utility building. Do not block the gate to the utility building! You can also access the trail from Trackside Drive in Kennebunk. Drive down to the very end of the unpaved street, past Old House Parts. The trail departs on the left from the very end of the street. Several active businesses are here, so be careful when parking to stay of the way. Picnic potential: no tables, but there is a wide bench at the western end. 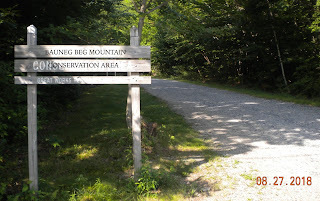 Bauneg Beg Mountain in North Berwick is a nice short hike, perhaps 30 minutes each way. The summit is partially open and affords views of Mt. Washington to the northwest, and the ocean on the east. 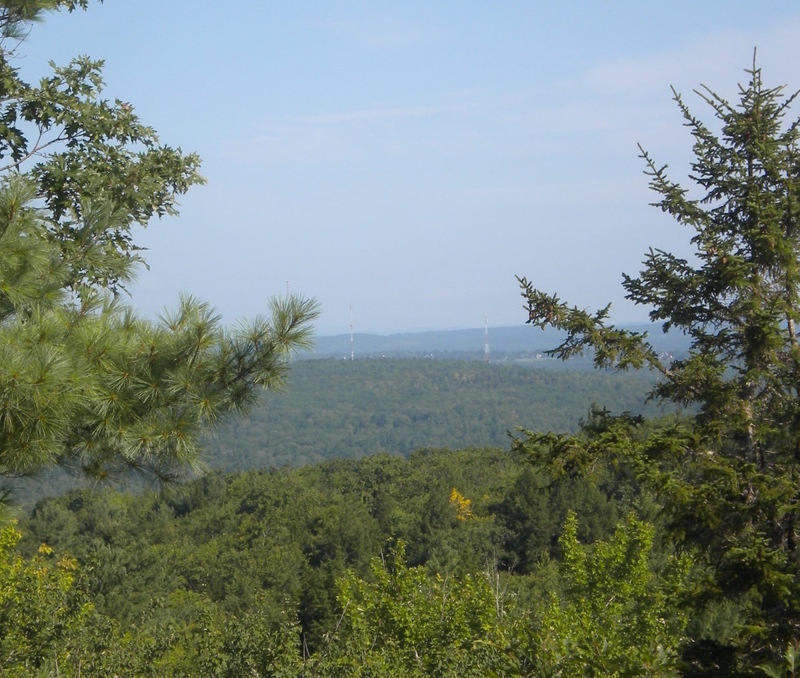 The land is managed by Great Works Regional Land Trust and is open to the public. 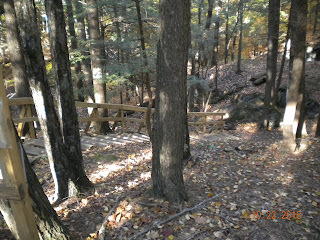 The trail starts at the parking lot and uses a number of short wooden trestles to cross seasonally-wet areas, although it was bone dry during our August visit. Don't follow too closely - the protocol on these trestles is one person at a time. If you are behind someone on the same trestle, one of you may get tossed off if the other tips it! Most were solid but we did encounter one tippy one. 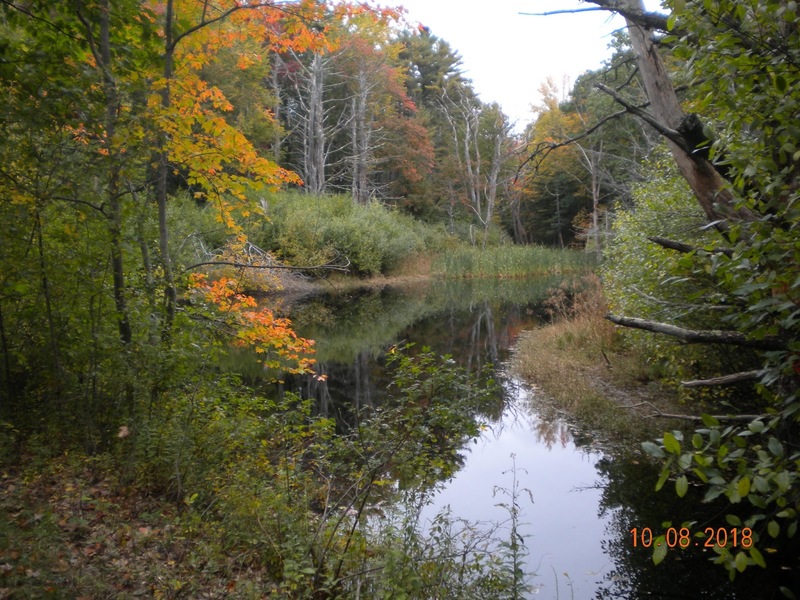 The trail ascends through the forest and over occasional diagonal water diverters. We went to Middle Peak, which is open. 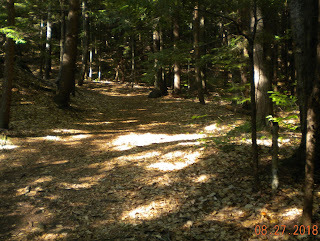 A side trail leads to a secondary (wooded) North Peak summit. 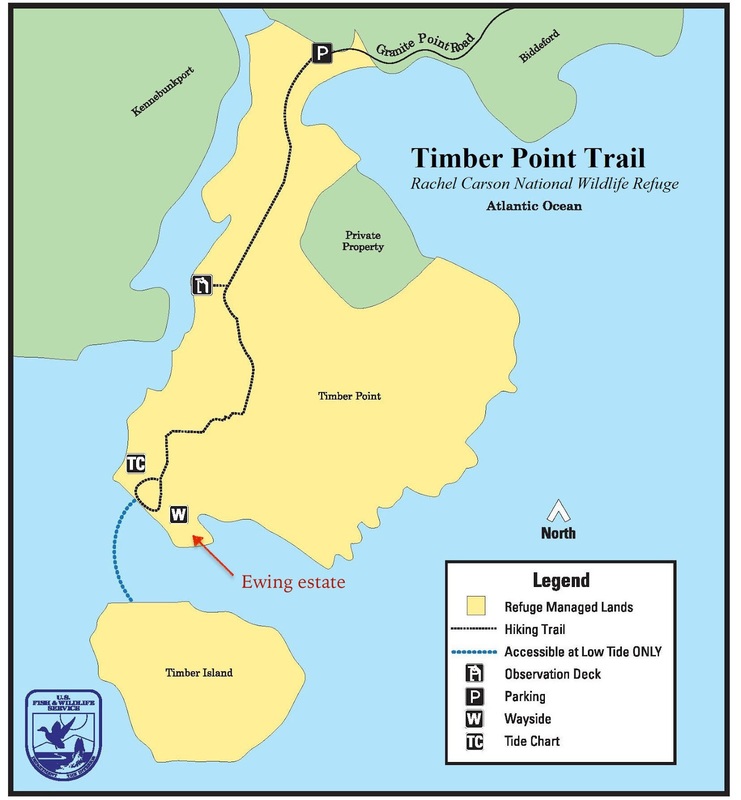 Get the trail map from the link below so you don't get confused by connecting side trails. 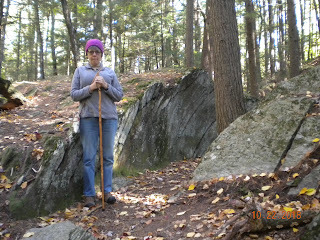 We followed "Ginny's Way" which is a gentle ascent. 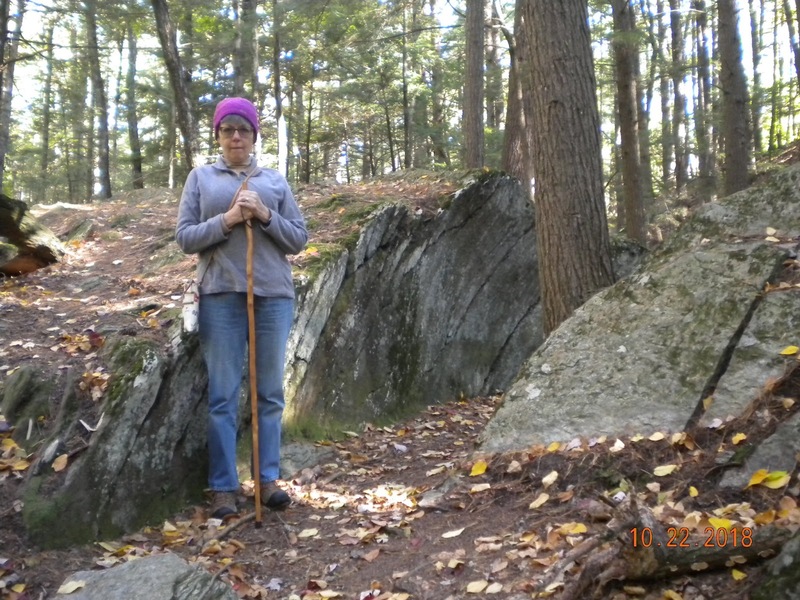 "Linny's Way" is more rugged. 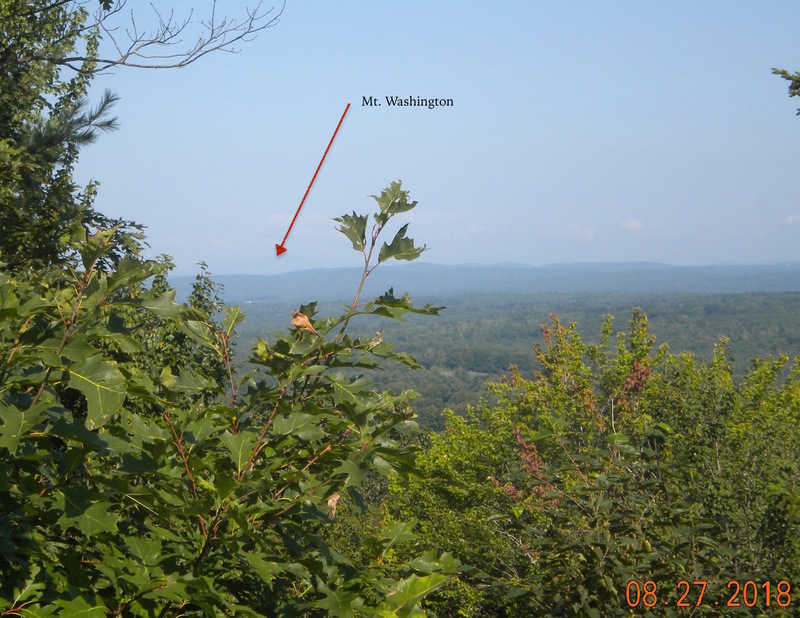 The Middle Peak lookout is 866' elevation - higher than Mt. Agamenticus. 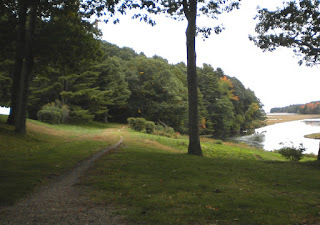 From North Berwick, head north on Rte 4 towards Sanford 2.1 miles. 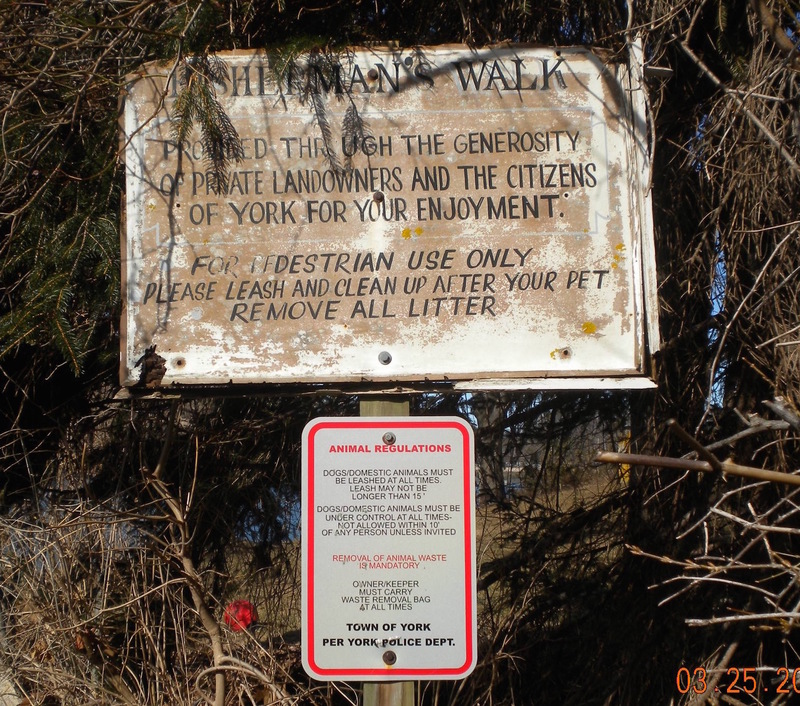 Left on Boyle Road, continue straight across Valley Road as it becomes Ford Quint Road, about 5.5 miles. Left on Fox Farm Hill Road, sign and parking lot on left, about 0.3 miles.